A classic six armed ceiling light finished in a hand brushed distressed cream colour with golden fleck highlights. Suspended from a circular ceiling rose, it has an old fashioned hook where the chain sits. The centre finial is bell shaped with six arms creating a cage appearance fall, these gently twist together before curving upwards towards each candle sconce. Height adjustable at the time of installation by simply shortening the chain suspension to suit your requirements. Minimum height 50cm, maximum drop 730cm. Optional 100% silk tapered shades are available to purchase separately for this elegant light fitting and are available in twelve different vibrant colours. Please click here to view and purchase these items individually. 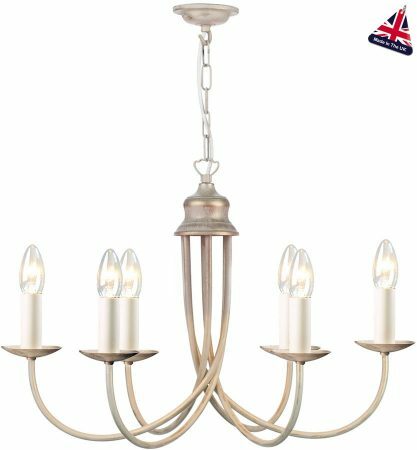 Other products in the distressed cream David Hunt Lighting Bermuda range can be viewed below and include a matching twin wall light. Made in the U.K. to the highest specification. Please allow 2 – 4 weeks for delivery.